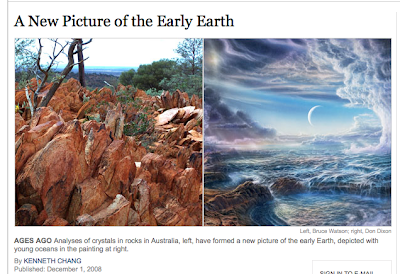 No real analysis here, but I'd like to draw your attention to this recent article by Kenneth Chang in the New York Times about recent work that might shed light on the very early earth. I am highlighting the article both because it deals with geochronology (U-Pb zircon geochronology to be exact), and because it is a rare article dealing explicitly with geology; not modern climate change or some geoscience themed hazard, but straight up geology. The article also has some good quotes from some of the grand high mucky mucks of geology including Mark Harrison, John Valley, and Norm Sleep. I've seen a talk version of some of this data before, and when I get into my office tomorrow I'll check out the Nature paper as well and try to comment, although in all honesty I seriously doubt I'd come up with much more insightful than Professors Harrison, Valley, Sleep, and Mojzsis. In consideration of self promotion, if you'd like some background on geochronology to help with the NY Times article, check out this earlier post of mine, or any of the background geology posts I have listed on my sidebar. Norm! I can just see him calculating something like the probability of life surviving the Hadean. ... well written people, I enjoy a good, interesting blog!